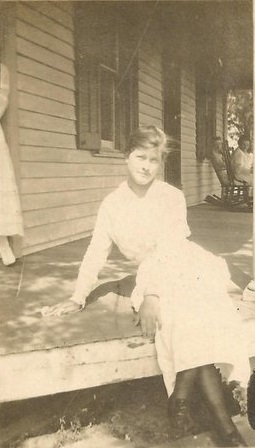 She’s unidentified but striking a casual pose as she sits on the edge of a porch. Why do I think it’s a farmhouse? The edge of the long skirt at the left and the rocking chair in use at the other end of the deck suggest a Sunday afternoon in pleasant weather. Posted in Speaking from experience.Tagged Genealogy, History, Ohio, Photos.